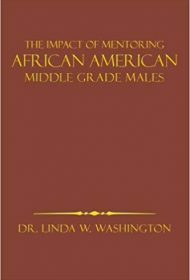 Dr. Linda W. Washington, an educator with degrees in administration, business, and leadership, presents a scholarly analysis of the forces behind educational struggles common to African American male middle schoolers and prescribes mentoring as the best form of intervention to address performance and discipline problems. Washington notes that the core of mentoring is the formation of quality relationships (bonding) between students and teachers, the school community, administration, and parents. By emphasizing the “we” in education, she believes disenfranchised students can achieve purposeful involvement and a sense of belonging based on shared beliefs. According to Washington’s data, a statistically significant number of impoverished, black, single-parent households with working mothers raise boys who enter school with few individual attachments, due to absent fathers, isolation, and boredom. This is their greatest obstacle to achievement. Tardiness, absenteeism, violence, academic failure, and a sky-rocketing drop-out rate are the result. For Washington, positivity, rewards, academic rigor and real-world application will build trust and genuine social and intellectual engagement for these students. While Washington lists general mentoring behaviors for teachers and administrators to consider (co-operative learning, raising teacher expectations, building student self-esteem, etc. ), she does not describe steps for implementing and structuring a mentoring program within a school or district. Exactly what such a program would look like is not discussed. Washington does a thorough job of defining the problem and identifying the benefits of mentoring, but a practical framework is never presented here. In addition, Washington overwhelms readers with defense of her research methodology and decade-old statistics, offering charts, tables, raw data from interviews, and condensed versions of educational and attachment theory that make for an extremely clinical read best suited for administrators or researchers, rather than classroom teachers. One also wonders why this study excluded African American middle school girls as equally excellent candidates for the benefits of a school mentoring program. Despite such flaws, those interested in an academic discussion of the topic might find some value here.